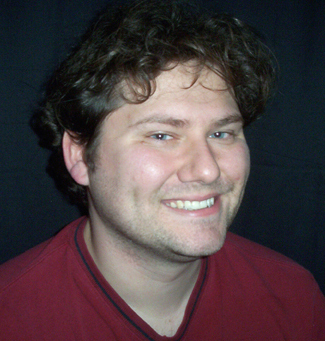 I still haven’t met Tim Pratt, but his reputation made me expect I’d love his Pathfinder Tales novels, and I do. Also, I have it on good authority that he’s a helluva nice guy, so I’m hoping we bump into each other at a convention sooner rather than later. On the other hand, he’s earned my eternal envy by being the first to write about Numeria, a land of super science clashing with magic (in City of the Fallen Sky) and to introduce a talking sword as a major character (Liar’s Blade). I wanted dibs on those! So curse you, Tim Pratt, you, uh, clever and talented nice guy, you. 1. What’s the most unwriterly job you’ve ever had? in an antique store, various admin jobs). In high school I spent a couple of summers laying insulation, which served to convince me I would prefer employment that involved more sitting around and less inhaling fiberglass. 2. In Pathfinder Tales, you beat me to talking sword! (To be fair, so did Monte Cook.) You beat me to Numeria! How do you keep figuring out my favorite tropes and getting there first? What I’m getting at is, what elements of your personal tastes do we see in your use of the Pathfinder setting? Ha! If it makes you feel better, I routinely pitch things to Paizo only to hear them say, “Sorry, someone else is already doing that.” I am a big fan of weird science fiction/fantasy crossovers—robots vs. wizards? Absolutely!—so getting to write about Numeria was a thrill. As for the talking sword in my novel Liar’s Blade (and a sequel that doesn’t have a title yet, which I’m writing next year), I wanted to sort of mash-up the character dynamic of Fritz Leiber’s Fafhrd and the Gray Mouser with Michael Moorcock’s Elric and his cursed sword Stormbringer—what if someone had that “two halves of a sundered whole”/”one soul in two bodies”/buddy-road-trip comedy relationship like Fafhrd and the Gray Mouser have, but with their sentient magical sword instead of another person? Seemed like a winning combination to me. Basically, I like excuses to write banter. 3. Obviously you enjoy a bit of jocularity in your characters. Which writers (for prose, television, film, whatever) have informed your sense of humor? How about non-writers? Growing up I loved the surreal, deadpan humor of comedians like Steven Wright, and cultivated a jaded sarcasm that was wholly unearned given my youth. As I got older I discovered classic screwball comedies, which influenced the way I write dialogue a lot. There are some modern TV and film writers who do the kind of banter I love—the kind that entertains as it illuminates character—like Joss Whedon at his best, and Amy Sherman-Palladino. For comedic prose writing, I worship at the separate altars of Wodehouse and Pratchett. I tend not to write straight humor, but funny moments inevitably creep into my work. 4. Your work makes me think you’re a past or active gamer. Do you tend to be a player or GM? How do you feel the writer’s role compares to that of the GM and player? A lot of people see writers as GMs, but I wonder whether it’s as simple as that. I mostly ran games, back in high school. Created my own campaign settings, the whole deal. The problem was, that used the same part of my brain I used to write fiction, so I gradually moved away from running games to focus on writing stories. In that sense, I think there is a connection between writing and being a GM—creating a world, trying to develop a plot that works with the characters involved. The difference, of course, is that as a novelist you’re an absolute dictator, and can do anything you want, while a good GM understands that he’s collaborating with his players, and has to be willing to improvise when they deviate from whatever he had planned. 5. As a Hugo-winning author who also writes tie-in fiction, do you find that readers or publishing people react differently to your tie-in work? How should we tie-in authors respond to the popular misperception that all tie-in fiction is crap? It’s a misconception I try to combat, certainly. When I talk about writing roleplaying game novels, I mention my love for playing the games when I was younger, how delighted 14-year-old me would be by the idea of writing RPG novels, and how I discovered the works of H.P. Lovecraft and Fritz Leiber from reading gaming manuals. I talk about how RPG writing allows me to indulge my love for sword-and-sorcery. From a purely mercenary standpoint, I explain how publishing these kind of books allows me to reach an entirely different audience from those I do with my non-tie-in work. I haven’t noticed a huge difference in how people respond to my tie-in work, though it tends not to be reviewed in the same sorts of places, and it’s possible people are just not voicing their contempt where I can hear it. 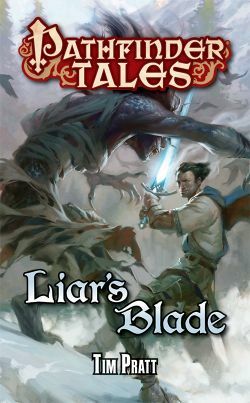 I think Liar’s Blade is as good as any of my non-tie-in urban fantasy novels, and don’t mind telling people so. For way more information on Tim, check out his website. This entry was posted in Writing and tagged Creative Colleagues, Pathfinder Tales by Dave Gross. Bookmark the permalink. A very enjoyable Q&A, perfectly timed as I’m currently reading Liar’s Blade – and loving it. You posed an interesting last question. As a reader, I’ve seen there is a lot of people in the genre snub RPG tie-ins or even sword & sorcery in general. At least that’s the case in Greece, I’ve no idea what’s going on over there. Here is the thing, though, non-fantasy readers snub the genre in general because they consider it childish and less-than-literature. I’ve had to endure this attitude from friends, family and acquaintances for years! So it makes me sad when I see fantasy readers snubbing fantasy as well. I partly blame exactly that: our society has certain standards according to which good literature must be realistic, gritty and deal with the Great Themes. So, as readers of fantasy, we sometimes tend to overestimate this sort of fantasy literature and underestimate everything else – because, fun and adventure are not so “literary”. I think we need to keep an open mind and judge each book based on content, writing, characters and dialogue, regardless of where it comes from, otherwise we might miss on our next favourite book.